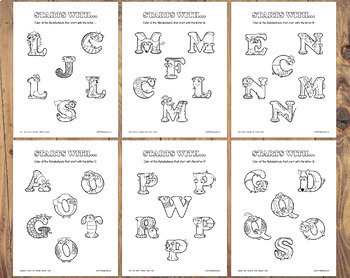 Learning starts with play, and nothing mixes the two more uniquely than the Alphabetimals. 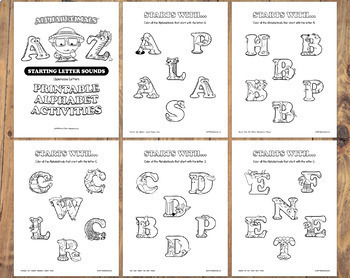 These adorable cartoon animals shaped like letters have a secret built-in hint to help even the youngest children start remembering letter shapes and sounds. 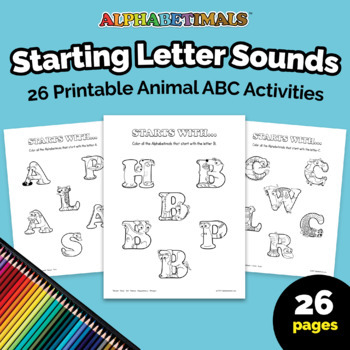 Our Starting Letter Sounds worksheets bring your child on an A-Z adventure, figuring out which animals start with each letter of the alphabet and coloring them in - including variations with soft & hard C & G sounds, and long and short vowel sounds. First unzip your downloaded file. If you need help unzipping your files, there is an easy walk through here: http://www.wikihow.com/Extract-Zip-Files. Next, open Adobe Reader and then go to "File>Open" and navigate to your downloaded file. If you don’t have Adobe Reader installed on your computer, you can download it for free here: https://get.adobe.com/reader/. NOTE: MAC USERS, if you double click to open your PDF, it may open your file in “Preview” instead of “Adobe Reader.” The work around for this is to open Adobe Reader and make sure you go to “File>Open” and open the file (instead of double clicking on the file to open). Alternately, you can right click on the file from your downloads folder and choose “Open With…” to choose Adobe Reader. 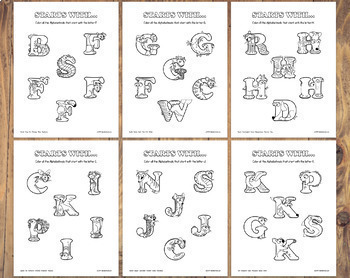 Print at home on your printer or take files to a print shop to print. If printing in the US, simply select either "fit to page" or "shrink oversized pages" in your printer settings, to ensure correct printing to US letter paper. If you want to save money and ink, make sure you print in black & white! If you are going for quality make sure to use your photo settings or high quality settings to make the pages print out nice and crisp. By purchasing this resource, you are agreeing that the contents are the property of Patrick O’Toole and licensed to you only for classroom / personal use as a single user. Please do not re-sell these images nor re-share this images on websites, groups, or other media without my permission. All rights are reserved by the artist (© 2019 Patrick O’Toole) and may not be reproduced. If you are interested in licensing my art or for any type of commercial use please contact me. Please DO share this listing with anyone interested in having their own copy to purchase.